A prayer service, a party and a pilgrimage. Benedictine Sister Sharon Bierman, longtime administrator of St. Paul Hermitage in Beech Grove, began her retirement celebration on June 25 with a prayer service in the Hermitage chapel followed by a party where she greeted friends from three decades of ministry at the retirement home adjacent to Our Lady of Grace Monastery. On Sept. 5, she will embark on a two-week pilgrimage to Benedictine monasteries and other holy sites in Italy with Benedictine Sisters Mary Luke Jones and Joan Marie Massura. June 30 was Sister Sharon’s official retirement date, but she said a part of her heart will always remain at the Hermitage where she enjoyed ministering for 33 years. She began working at the Hermitage on Aug. 7, 1978, and served as a physical therapist and director of rehabilitation until Jan. 1, 1999. On April 3, 2000, she was named the seventh administrator, an assignment that she cherished because it gave her daily opportunities to interact with residents and their families. Benedictine Sister Rebecca Marie Fitterer, a registered nurse and former director of nursing at the Hermitage, begins her new ministry as the health care facility’s eighth administrator on July 1. Currently, there are 110 employees and 104 residents. Among her other duties, Sister Rebecca will oversee a new capital campaign in 2012 to raise an estimated $2.4 million for necessary facilities improvements to the Hermitage, which also houses a retirement wing for priests and a health care center for residents with medical challenges. 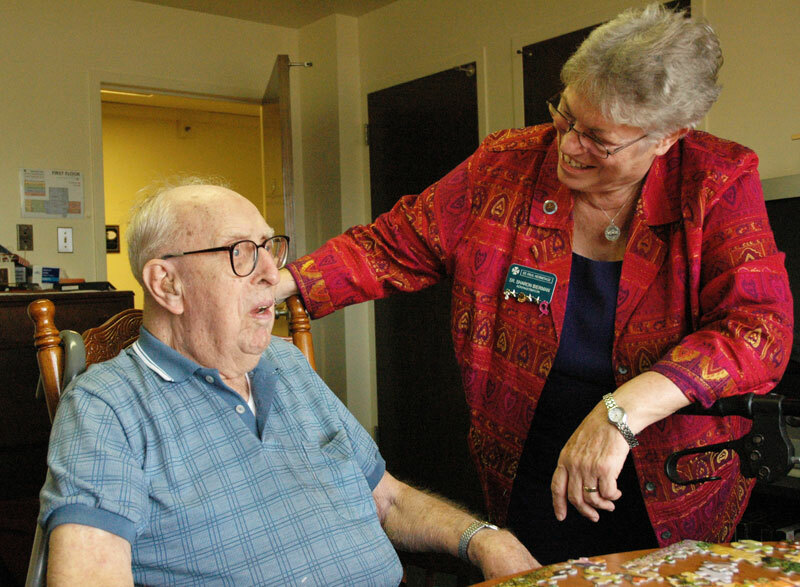 Benedictine Sister Juliann Babcock, prioress of Our Lady of Grace Monastery, said Sister Sharon’s love for the elderly has enriched the sisters’ ministry at the Hermitage, which was founded at the request of the late Archbishop Paul C. Schulte in 1960. “Sister Sharon certainly reflects a compassionate presence and a caring manner for each resident and each staff person,” Sister Juliann said. “She is very dedicated, and I know loves each person that is presently at the Hermitage and has been there throughout those 33 years. It’s amazing that she remembers their names and their families. During 11 years as administrator, Sister Sharon was instrumental in coordinating plans for resident-centered care as well as raising funds to hire a residential nurse, buy a 14-passenger bus, and renovate the Hermitage entrance, dining room, rehabilitation department, recreation room and beauty shop. She also arranged for each resident to receive an emergency pendant, installed a code alert system on doors, began weekly news updates, and published comprehensive handbooks for health care, employees and residents. Sister Sharon also served her sisters as the physical therapist at the monastery. Later this year, she will complete a clinical pastoral education course for certification as a chaplain. “I want to become a chaplain for either a hospital or a hospice,” Sister Sharon said. “I’ve helped a lot of Hermitage residents transition from this life to the next. … My dream would be that I could be on call for God. I would visit people in the hospital and in health care facilities, and be present when God may be calling them home. Sister Sharon’s legacy will continue at St. Paul Hermitage thanks to six core values that she introduced for employees and residents—respect and dignity, teamwork, hospitality, community building, honest communication, and personal and professional growth.